(Nanowerk News) Following the isolation of graphene in 2004, a race began to synthesize new two-dimensional materials. 2D materials are single-layer substances with a thickness of between one atom and a few nanometers (billionths of a meter). They have unique properties linked to their reduced dimensionality and play a key role in the development of nanotechnology and nanoengineering. The innovation is described in an article published in Nature Nanotechnology ("Exfoliation of a non-van der Waals material from iron ore hematite"). The research was conducted at the Center for Computational Engineering and Sciences (CCES), one of the Research, Innovation and Dissemination Centers (RIDCs) funded by the São Paulo Research Foundation - FAPESP, and during a research internship abroad that was also supported by FAPESP . 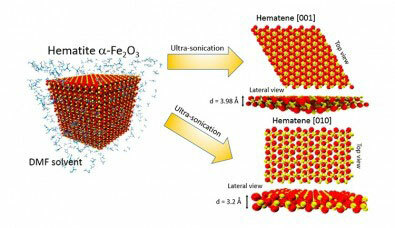 Liquid-phase exfoliation of hematite to hematene.